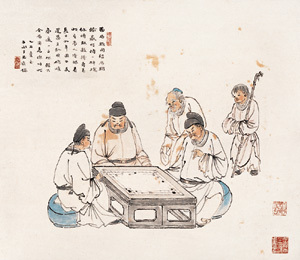 As a crystallization of wisdom, the game of go (wéi qí 围棋) is a legacy of traditional Chinese arts, and has contained many rich values and profound cultural significance throughout the ages. Together with playing musical instruments, reading, and painting, it was considered as one of the essential qualities for ancient Chinese literati. 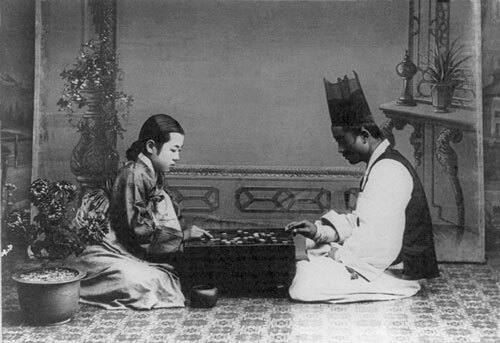 As a traditional form of art, the game of go also boasts a number of legends about its origin. One of the best known is that when Emperor Yao (yáo 尧帝) married Fuyi Shi (fù yí shì 富宜氏) and had a son named Zhu (zhū 朱), Yao became very disheartened when the son did not behave well. So Yao made the game of go to cultivate him morally and intellectually. Meanwhile, some believe a political strategist in the Warring States Period (zhán guó shí qī 战国时期)(475-221BC) created it. 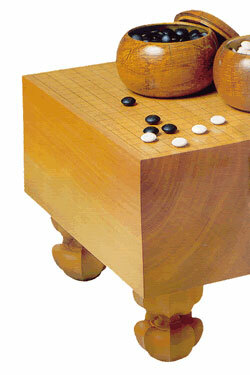 The board of go consists of a grid 19 by 19 resulting in, 361 intersections. The pieces are placed on the intersections in such a way as to gradually command more territory by surrounding and eliminating the opposition. Each of the two sides, one with black pieces and the other with white pieces, possesses 180 of them. It is an exciting and intense competition and the situation on the board keeps changing and unpredictable. Players have to resort to all sorts of tactics in order to defeat the opponent. As the tactics used in the go are so variable and profound, the ancient Chinese said in an exaggerated manner that only deities can invent such a game. 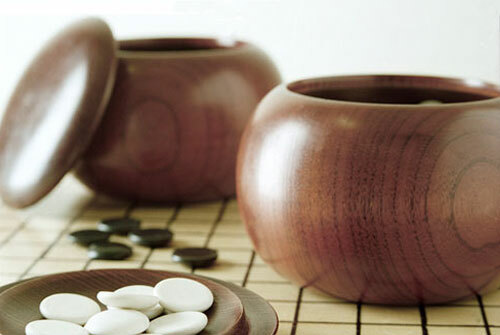 Playing go exercises the brain and enhances one’s sense of logic. At the same time, it can also cultivate temperament, build up character of perseverance and calmness. Therefore, go has become more and more popular with young people. Go was introduced into Japan during the Sui (suí 隋) (581—681) and Tang (táng 唐) (618—907) dynasties and into Europe in the 19th century. Today, it has spread to more than 40 countries and regions. Players form China, Japan and The Republic of Korea are of the highest skill in the world, and Chinese competitors Nie Weiping (niè wèi píng 聂卫平)and Ma Xiaochun (mǎ xiǎo chūn 马晓春) enjoy international fame. Go has been developed into a very important international contest.